The most fluffy, rich, decadent frosting for your cake! Chocolate Ganache Frosting is an easy way to make your cakes and cupcakes scream with flavor. I’m often asked about chocolate ganache and how to make it smooth. So today, in addition to giving you a delicious cake recipe, I’ve also got some great tips on making ganache. You may be looking at the cake and wondering, how does that even connect, I don’t see ganache. Well, most people typically think of a ganache as that creamy, rich melted chocolate on top of cakes or between layers. Ganache can also be used to make the filling for truffles. And, like today’s cake, you can also whip your ganache into a rich, fluffy frosting! Oh yeah. method. Chocolate can scorch if directly heated and it won’t be pretty (or delicious). When using a double boiler, heat your small saucepan with about an inch or two of water. The steam will heat the double boiler (you can use a standard double boiler, or a glass bowl). That’s when I put in the chocolate and cream and stir stir stir until smooth. DO NOT remove the double boiler from pot until the ganache is smooth and creamy (you don’t want to get any moisture in with your chocolate or it may seize). Many times, I make my ganache in the microwave. Carefully. Start with a clean, dry glass bowl. Add your chocolate and cream and heat for one minute. Stir your ganache and heat in 15 second increments until the chocolate is smooth and creamy. Depending on what I am making with the ganache it will determine how much cream I add to the chocolate. If I’m looking to make truffles, I’ll add less cream. If I’m making whipped frosting, I’ll add more cream. You really can’t go wrong once you learn the technique! Occasionally when making the whipped frosting, it comes out too thick. If this happens to you, warm some extra heavy cream for about 30 seconds in the microwave (about 1/4-1/2 cup). Drizzle into your mixing bowl while beating on high. This will add a little extra fluffiness and lighter texture to your frosting. Be sure to heat it first though (not hot, just enough to take the chill off). This keeps your ganache from hardening when you add the cream. So let’s talk about this cake! I started with a chocolate cake mix. I know, I don’t use them often. But in today’s recipe, it’s the frosting that makes this cake shine! 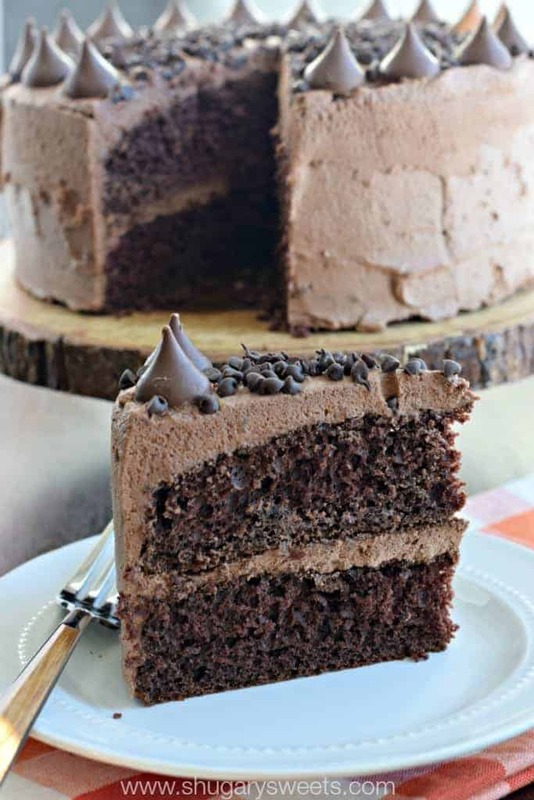 If you prefer a homemade cake recipe…try out my favorite Dark Chocolate Cake (from scratch). It’s so easy and so delicious! to keep the layers flat (I hate leveling cakes, and these work perfect)! Before baking my cakes though, I start by making the ganache. Choosing one of the methods above (double boiler or microwave) I get my ganache smooth and creamy. I cover it with plastic wrap and set in the refrigerator for about an hour. Then I bake the cakes! Once you’ve baked the cakes, and cooled them on your wire rack, start your frosting. Take out that bowl of chilled ganache and whip it good! I use my KitchenAid mixer with whisk attachment to do this quickly and efficiently. If you have a handheld mixer, just make sure you are scraping down the sides of your bowl. You’ll know when you’re done because the frosting will be light and fluffy! Immediately assemble the cake, first by placing one layer on a cake plate. Top with a big blob of frosting, spreading evenly. Then add the second layer of cake. 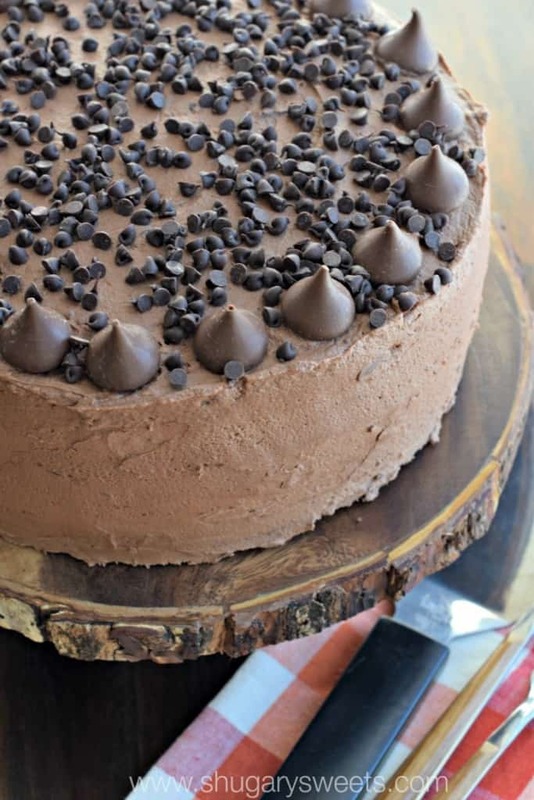 Using an offset spatula, spread the whipped ganache around the entire cake (sides and top)! 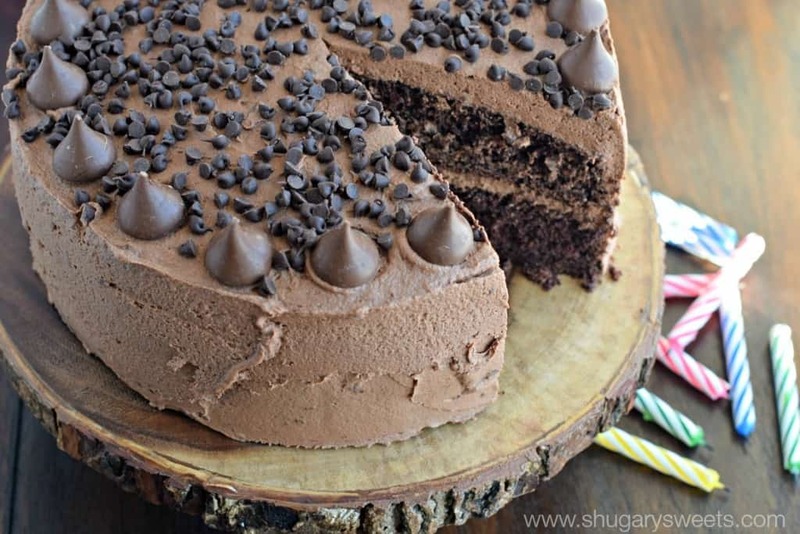 I added some candy and chocolate chips to the top of my cake, for a little chocolate decadence! Now. Here’s the big question. How do you eat your cake? If you follow me on instagram you will see my family enjoys a big slice of cake in a bowl of milk. We call it “cake soup.” People either love it or hate it. What do you think?? Love frosting? Here are a few of my favorites…. 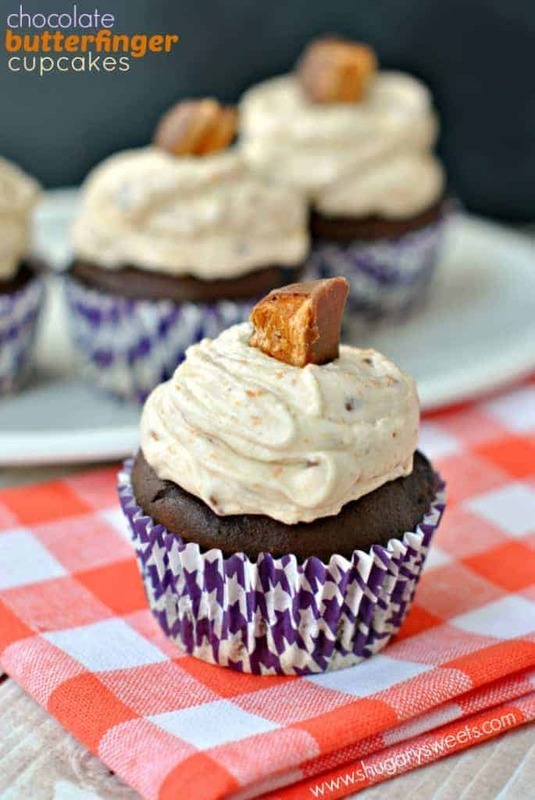 Butterfinger Frosting: seriously as good as it sounds! 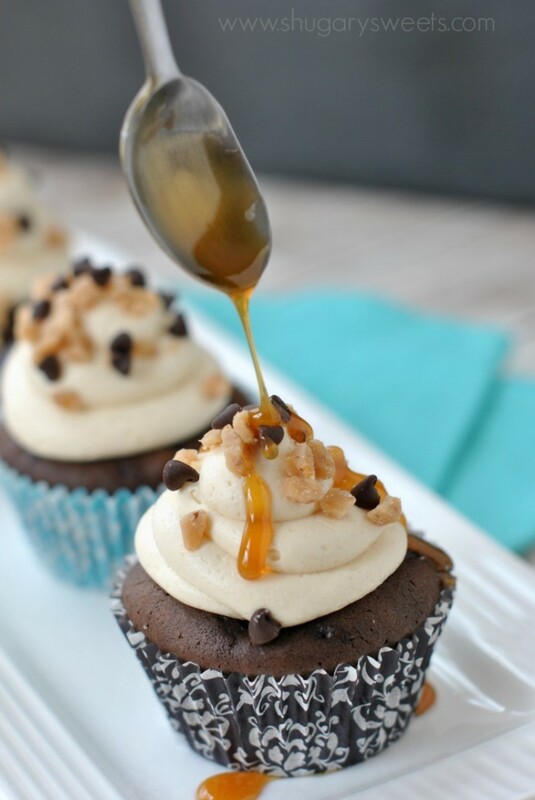 Caramel Toffee Frosting: decadent, easy, delicious!! 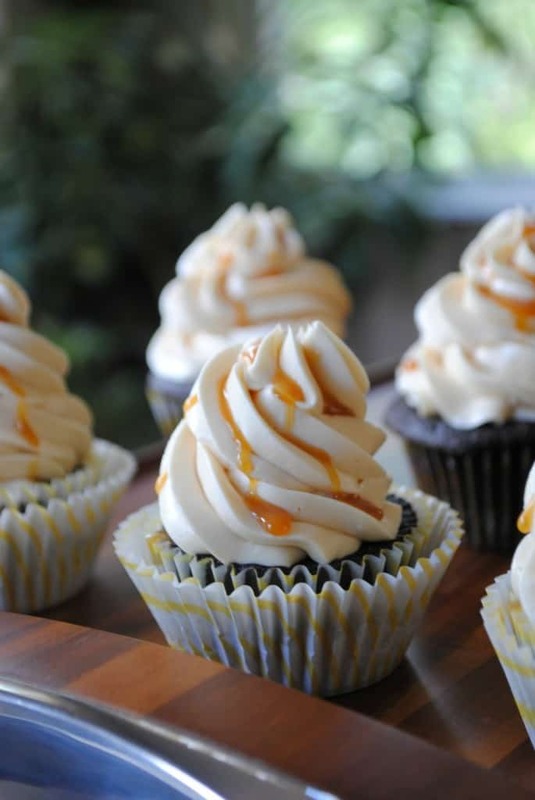 Salted Caramel Swiss Meringue Frosting: buttery smooth with a caramel kick! 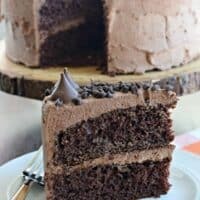 Dark chocolate Cake with chocolate ganache frosting! Prepare chocolate cake in two 9-inch round pans. 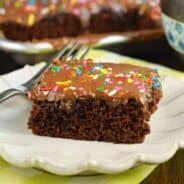 You can use a boxed mix or this dark chocolate cake recipe. 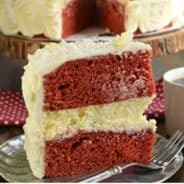 Allow cakes to cool completely. 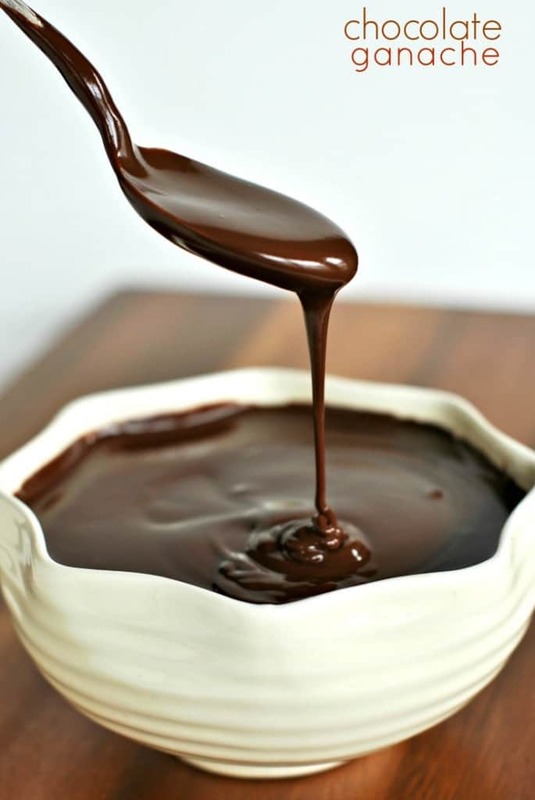 For the ganache, heat a double boiler or medium saucepan with an inch of water. Place double boiler on top of saucepan (or use a glass bowl). Add chocolate and heavy cream to bowl. Stirring constantly while melting, stir until smooth. Remove from heat and place in refrigerator for about one hour. Remove from refrigerator and using a stand mixer with whisk attachment, beat melted chocolate ganache on high until light and fluffy. Immediately spread frosting on cake. ENJOY. Wow, I like the idea of a fluffy ganache. Really, just like cake in general. My 2 daughters birthdays are coming up so maybe we should give this cake a whirl. Fluffy frosting just goes down so easy. What a gorgeous cake!! Annnnd now I’m dying to try cake soup… Can we just call it cake cereal and eat it for breakfast?? Cake cereal, haha, that’s genius! I never knew you could whip ganache! I am so there. What a great way to make frosting! And adding Hershey Kisses is kind of the best thing ever. I have that same cake stand!!! So cute! Oh my! You had me at chocolate! Can’t wait to give it a try! Chocolate ganache is so simple, yet so amazing! Thanks for the great tips! Lovely chocolate cake and ganache, Aimee! Fabulous tips, too. Thank you for sharing and enjoy the rest of your week! The frosting is pretty darn extraordinary! I can’t see straight because I’m so in love! Omg one of your most beautiful cakes EVER!! What a showstopper! I wish I was having it right now! A huuuuge slice! Looks amazing! Awww thanks Averie, you’re too sweet!! Beautiful Cake! I totally agree with Averie. I wish I had some right now! Oh my, this cake!! I need a slice! Ganache frosting is my favorite! Oh, how I love me some ganache…warm and melty or whipped into frosting!!! Either way it’s awesome stuff!!! This is one striking cake…I love all the chocolate action going on in it!!! And the stand is too cool!!! Anything with chocolate sounds good right now! I really want to make this cake right now. too bad all I have is a vanilla cake. These are some seriously great tips Aimee! I am in LOVE with ganache frosting! The way to my heart, this looks heavenly!! I have always hesitated to make ganache. I am not sure why because it seems so easy and looks so delicious! This is one serious cake! And that whipped ganache, AMAZING! GAH! I love a good chocolate ganache frosting! Thanks for the link love to! Chocolate ganache is my favorite! What a beautiful cake! Chocolate ganache is my absolute favorite! I can probably eat a large bowl full with a spoon, I don’t even need the cake..this looks amazing! Seriously mind blown. Not only did I just learn what a bake strip is (had to google it, I’m a dork! ), but I’m loving this whipped ganache! I just want a HUGE bowl of that frosting and a spoon. No cake, milk, or anything else necessary. 😉 I’ve never heard of serving cake in milk before, but it’s almost like have a scoop of melty ice cream, which isn’t strange at all, right? 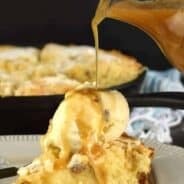 I think I may have to try cake soup sometime! Pinned! That cake is gorgeous, the frosting is amazing. This is just to die for!!! hooowwww have I never made ganache into a frosting??!!! dying right now!!! You’ve got to try ganache frosting, mmm mmmm!!! And now I’m craving for cake. Love it! Wow! A dessert I never heard of, Cake Soup?!?! I have had Cookie Soup so many times. Will have to try your Soup! Oh my! This is truly a chocolate lovers dream. Thanks for the recipe!! !